The Great American Solar Eclipse of Aug. 21, 2017, as seen over Madras, Oregon. Suffering through some eclipse withdrawal? A crowdsourced "megamovie" of yesterday's epic event could cure what ails you. The Eclipse Megamovie Project released its first video yesterday (Aug. 21), showing gorgeous views of the Great American Solar Eclipse captured by about 1,500 volunteers along the nationwide "path of totality." The 2.5-minute video is more than just eye candy; it gives researchers a good, long look at the sun's wispy outer atmosphere, or corona, which is visible from the ground only during total solar eclipses, project organizers said. The eclipse photos were "algorithmically stitched together based on the time and location of the photo; gaps in the coverage are filled by the previous image," Megamovie representatives said in a statement. "As more photos are uploaded and processed, these gaps will be filled in and the movie will get better and better, providing opportunities for the scientific community to study the sun for years to come." 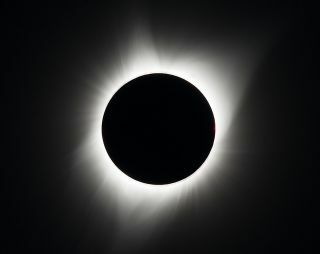 Eclipse Megamovie is a joint effort involving solar physicists at the University of California, Berkeley's Space Sciences Laboratory and Google engineers. (The Google group adapted a photo-stitching algorithm first developed by researchers at the University of Colorado Cooperative Institute for Research in Environmental Sciences and the National Center for Atmospheric Research High Altitude Observatory in Boulder, Colorado). This story was updated on Aug. 29 to clarify that the photo-stitching code used by the Megamovie team was first developed by scientists at the University of Colorado Cooperative Institute for Research in Environmental Sciences and the National Center for Atmospheric Research High Altitude Observatory.